Let me first apologize for the graininess of this picture. It underwent some serious work in Photoshop before it ended up this way. 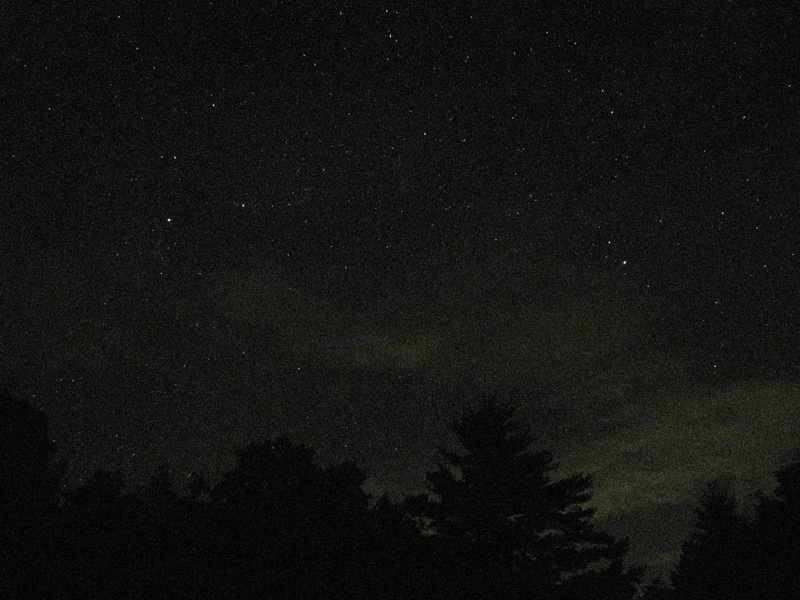 My original shot was almost entirely black, aside from about 5 specks of light from the brightest of the stars. I went with another group of friends up to the cabin in Sparta. The first night there, we had some pretty intense thunderstorms, but the sky really cleared up after they passed. This picture was taken at about 1:15 am down by the lake. From my previous experience trying to photograph stars (see here), I knew that I needed to use the tripod and as long of an exposure as I could. Unfortunately, the longest exposure the camera allows is 15 seconds, which was not quite enough to bring out most of the stars. As a side note, I have since discovered ways to extend this to over 30 minutes, something I hope to get a chance to experiment with some day. Anyway, like I mentioned above, the picture came out with only a few pinpricks of light. I decided to load it up into Photoshop in order to play around with it a little. Using the Shadows/Highlights tool as well as the manual Curves adjuster, I was able to bring out a little more of the image. Not only can you see many many more stars, but you can also see the silhouette of the trees around the lake as well as the remnants of a cloud in the bottom right. Unfortunately, doing this is what also introduced the grainy aspect to the picture as well. I think it’s a small price to pay for all of the extra detail brought out in the process. I know I’ve said it before, but one of the things that I enjoy so much about going up to the cabin is the feeling of peace and quiet that comes with really getting away from the stresses of day-to-day life. And I think that this picture, more than any of the others I’ve posted from this location (or plan to post from this most recent trip) really captures that. It’s one of the few places that I can remember being where I’ve ever looked up at the stars and just been astonished, and the only place I can remember ever being able to see the milky way for myself. Looking up at this after a mountain thunderstorm, or sitting on the dock a few months ago, seeing the moon through the clouds reflected on the surface of the lake, are the kind of memories I can turn to when things start to get rough and I need a place to escape to for a little while. I also have the memories of the weekends spent with some of my closest friends from school, which I will always hold close to my heart. In case you didn’t know, last night was supposedly the peak of the Leonid meteor shower for this year in North America. Together with a group of about fifteen people from the dorm, we decided to go out into the cornfields by the cross country track last night around 1:30 to try to get a little farther away from the lights on campus and hopefully catch some cool looking meteors. Unfortunately, when we got there, there were a lot of clouds out in the sky, with only a few patches of black sky peeking through. After about twenty minutes, a couple of people gave up hope and headed back to campus. 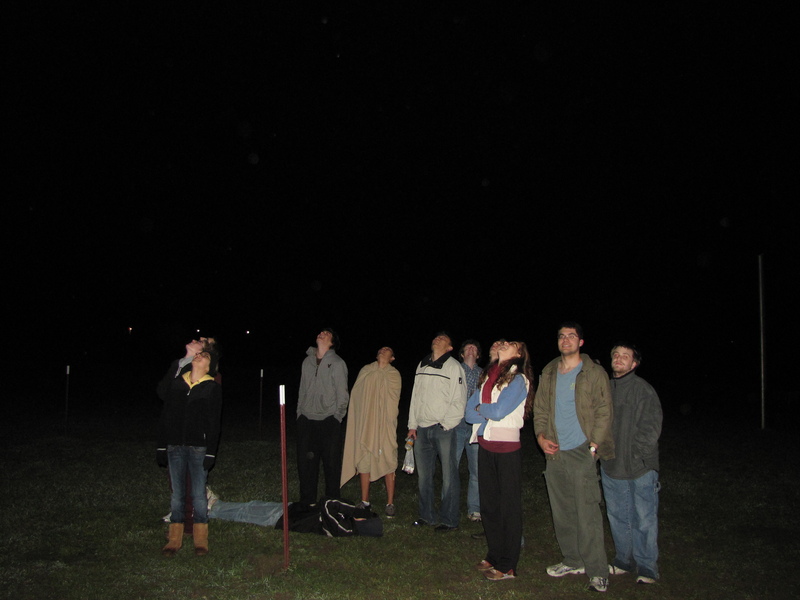 Thankfully though, the sky did end up clearing a little bit and we were able to see a decent number of meteors. It wasn’t spectacular, but it was definitely worth the time and those of us who stuck around all had a good time. I’ve never really had a chance to try out any astro-photography before last night. Unfortunately, I didn’t end up catching any meteors, but this one turned out pretty neatly and has some recognizable shapes in it. 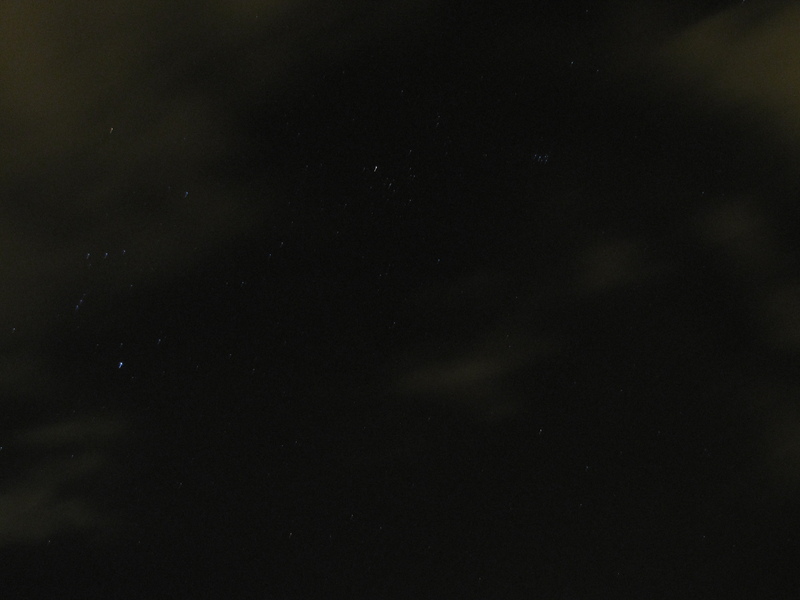 Orion is pretty clear on the far left. The “V” in the middle of the picture is the horns of Taurus, and the smaller cluster of stars just to the left of the “V” is the Pleiades. The stars are a little blurry because I forgot to set the delay on the camera so that it wouldn’t start taking the exposure until after I had let go of it. I guess I didn’t have the most stable of surfaces to mount my tripod on either, and I ended up wrapping it around the top of a narrow pole. I know it’s been a while since my last post here, but I’ve been pretty busy over the last week (and for the rest of this week too). This past weekend our salsa club took a trip down to Durham, N.C. We danced into the wee hours of the morning both Friday and Saturday night, in addition to taking some really awesome lessons and watching some amazing performances on Saturday. It was definitely the most fun I’ve had dancing in a long while, and I ended up meeting some really cool people. Unfortunately, I’m having to play catch up on a couple of assignments that I wasn’t able to work on this weekend, but I’m definitely glad I went.